Harold Pinter had already been credited with changing the face of British theatre before The Caretaker appeared in 1960, but it was this play’s commercial success which saw the word ‘Pinteresque’ first used (by The Times) to describe his characters’ rhythmic, colloquial speech, peppered with weighty pauses and loaded with implied threat. The play tells the story of opportunistic hobo Davies as he settles into the attic room of a dilapidated house with brothers Aston and Mick. 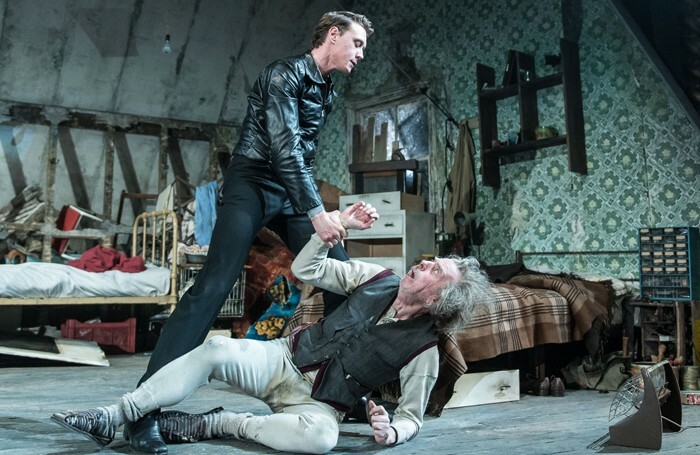 Aston has been traumatised by brutal treatment for mental health problems, but is mild and weak in comparison to the sharp-tongued Mick, who purposefully scares and confuses Davies as he plans a slick renovation for the West London flat. Each faces a harsh reality, but Pinter’s play is also an absurdist comedy about an unlikely power struggle – where every man’s for himself. This Old Vic production is the second to be directed by Matthew Warchus in his first season as Artistic Director and, as he did for The Master Builder, he works with designer Rob Howell. 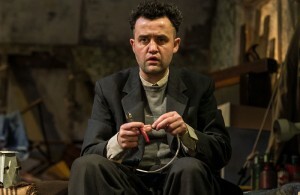 Onstage are Timothy Spall as Davies, Daniel Mays as Aston, and George MacKay as Mick. Megan Vaughan rounds up the reviews. Poor Timothy Spall, who is ascribed every possible version of ‘rat-faced’ or ‘rodenty’ there is going. 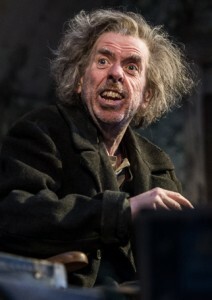 Still, his appearance in The Caretaker is clearly striking, with Marianka Swain (Artsdesk ★★★) defining it as “somewhere between Dickensian grotesque, fastidious dandy and vaudevillian clown” and Andrzej Lukowski (Time Out ★★★) opting for “a bizarre mix of Russell Brand, Mr Twit and a very ill Victorian tramp”. More poetically, Natasha Tripney (The Stage, 3 stars) goes for the rather lovely “raggedy Bagpuss in a dead man’s coat”. Spall’s performance itself isn’t widely praised. Laura Foulger (The Upcoming ★★★★) calls it “scene-stealing” in the most positive way possible, but Henry Hitchings (Evening Standard ★★★★) thinks it “contains finicky bits of business that Pinter never intended” and Michael Billington (Guardian ★★★★) feels “there is an edge of danger and aggression to Davies that … gets lost”. Spall’s attention-grabbing performance does at least seem to match the scale and tone of the production. Natasha Tripney refers to “comic strip Pinter” and Michael Billington comments that “the approach here is more physical than metaphysical … Warchus’ production treats the play less as a microcosmic study of power-politics and more as a strange comedy about a trio of deluded outsiders”. The importance of sympathetic design emerges, although that doesn’t always equate to consensus. For Andrzej Lukowski, “the feeling of everything being overegged is compounded by Rob Howell’s monolithic, almost Tim Burton-esque set” but for Marianka Swain it’s “a period treasure trove… the perfect backdrop for the larger-than-life turn from Timothy Spall”. The Caretaker – so is it any good? That’s nothing compared to the reaction of Stephen Collins (Live Theatre UK ★) though. Collins found The Caretaker so “unpardonably dreary” that he “fled the auditorium” in the first interval.